For proper sizing, determine your dogs potential FULL GROWN ADULT size, then choose a crate that will be 4" inches taller than the top of your dogs head and 4" inches longer than your dog from nose to tail. 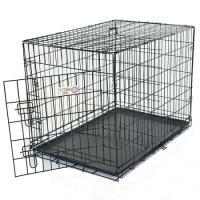 The divider panel is included to adjust the crate's living area to your puppies growth. This crate is best for breeds such as: Australian Shephard, Bearded Collie, Border Collie, Boxer, Chesapeake Bay Retriever, Chow Chow, Dalmation, Golden Retriever, Gordon Setter, Irish Setter, Labrador Retriever, Standard Poodle, Vizsla or dogs of similar size. "Shipment arrived in excellent condition and the product looks very good. Thank you for the excellent service."